October 3rd, 2017 — TRAXXALL Technologies, providers of an innovative aircraft maintenance tracking and inventory management system, today announced new client Executive AirShare. TRAXXALL delivers the most innovative aircraft maintenance tracking and inventory management system on the market today. Founded by established maintenance tracking experts, TRAXXALL is headquartered in Montreal, Canada, with offices in Jacksonville, FL; Wichita, KS and London, UK. For more information, please visit http://www.traxxall.com/learn-more. Executive AirShare serves shareowners in the Kansas City metropolitan area (Kansas and Missouri); Wichita, Kan.; Tulsa and Oklahoma City, Okla.; Fort Worth, Dallas, Houston, Austin and San Antonio, Texas; and Buffalo, N.Y. Its subsidiary, Executive Flight Services, manages aircraft for owners from bases in Fort Worth, Dallas, Wichita, Kansas City and Buffalo. 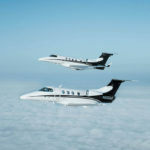 Executive AirShare currently serves the Central U.S. and Great Lakes regions, operating a fleet of Bombardier Learjet 45XR, Embraer Phenom 300 and Phenom 100, Cessna Citation CJ2+, and Beechcraft King Air 350i aircraft. Executive AirShare also offers aircraft management and charter services through its subsidiary, Executive Flight Services. For more information about Executive AirShare and its services, please visit http://www.execairshare.com.